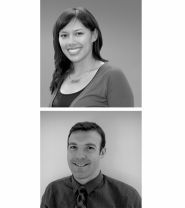 Holabird & Root is pleased to announce the promotion of Camille Yu, RA, and Matt Blewitt, RA, each to the role of Project Architect. Camille Yu, RA, has been with Holabird & Root since 2010. Camille’s background in engineering has been the foundation for her architectural career and given her an appreciation for the symbiotic combination of science and design. She has a strong interest in advanced building technologies, whether it be sustainability, structural systems, or interactive technologies. She holds a Bachelor of Aerospace Engineering and Mechanics from the University of Minnesota, Twin Cities and a Master of Architecture from the Illinois Institute of Technology. Camille has served such clients as Elmhurst College, Harper College, the Chicago Housing Authority and the Public Building Commission. Matt Blewitt, RA, has been with Holabird & Root for the past 7 years and has served as the head of the Holabird & Root BIM Committee since 2012. Matt holds a Bachelor of Science as well as a Master of Science (Research) in Biomedical Engineering from Saint Louis University, in addition to a Master of Architecture from the Illinois Institute of Technology. This background has made Matt indispensible in serving clients such as Fermi National Accelerator Laboratory, North Central College, City Colleges of Chicago, and the University of Chicago, in all their science and laboratory needs.